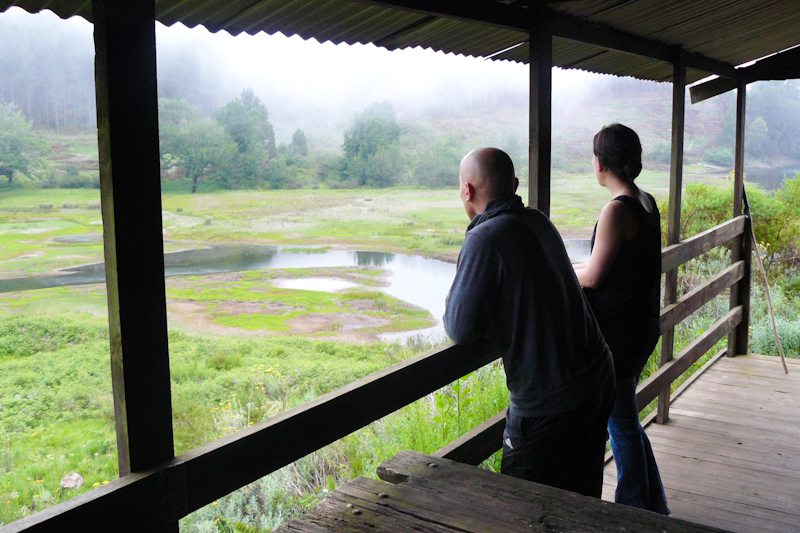 A while ago, Villiers and I joined eight other friends to hike the Dokolewa Pools Three-day Trail in Magoebaskloof. It was the first time either of us had visited, but it didn’t take long to realise why it has the reputation as one of South Africa’s foremost hiking destinations. And he certainly wasn’t wrong. A short walk later, just as it was getting dark, we arrived at the simple hut, dwarfed by the tall pine trees crowding in on it. We hurriedly dumped our over-stuffed backpacks and lit some candles before darkness hit. None of the cabins in the Magoebaskloof have electricity, so, huddling up beside a roaring campfire and sipping Amarula, we watched the forest plunge into night. No sooner had everything outside our circle of firelight turned black, than we received a Magoebaskloof welcome that surpassed all but our most unrealistic daydreams – dozens and dozens of fireflies, blinking in the inky darkness between the pine boles, transformed an ominous forest in darkness into a fairytale scene. For an hour or so it seemed as if all the stars in the heavens had dropped all at once to twinkle among us. The first leg of the trail may not be the longest, but Wouter warned us that is was the toughest, so we decided to get going early. At 8am, after a hasty group photo in front of the hut, we set off into the woods – all ten of us armed with water bottles, Leathermans and hiking sticks, and one of us with a mini-video camera strapped to his head. 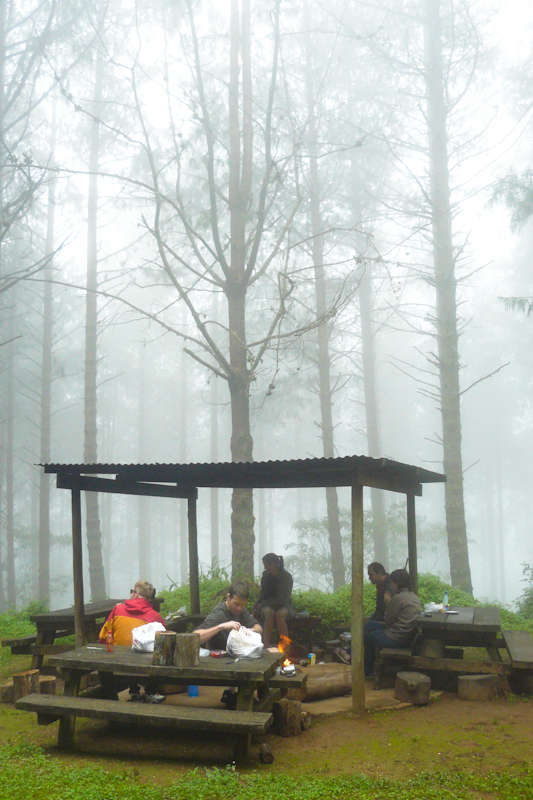 The thick mist shrouding the forest dampened everything but our spirits, and the colourful waterproof covers for our backpacks ensured we didn’t lose each other between the trees. 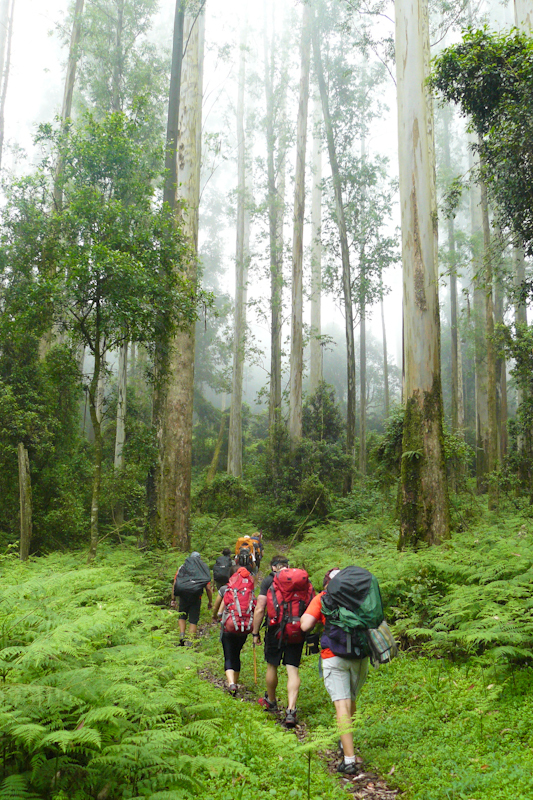 An hour into the trail we passed the world’s tallest planted tree – a Sydney blue gum tree that towers 81 metres above the forest floor. A short stop and another group photo later and we were on the move again. 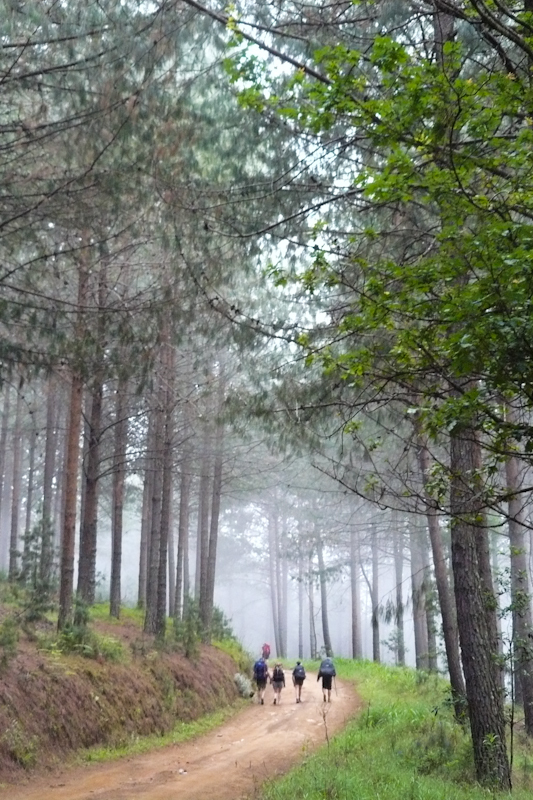 We spent most of the day hiking through indigenous forest, but from time to time the trail cuts back through pine and eucalyptus plantations. Wouter was right – the going is anything but easy. Day one has little by way of level stretches. You are either clambering up steep slopes, rueing the fact that you packed so many bananas, or cautiously manoeuvring your way downhill over fallen logs and slippery rocks, thanking your lucky stars that you ignored those who scorned your walking stick. Walking at the back, so as to admire the mesmerising forest without holding everyone up, we savoured every fern-filled gully and towering yellowwood tree. You’d be excused for expecting a jaguar to dart across the path, or perhaps imagining the ululating call of Tarzan swinging through the vines criss-crossing the canopy above. But all you hear when you stop and listen is the constant trickle of a nearby stream and the occasional squawk of a Knysna Turaco, or whistle of a Chorister Robin-Chat. At around 14:30 we reached the Waterfall Hut. Our group was almost equally divided between those that immediately flop their weary bodies onto the thin mattresses on the bunk beds, and those who whip out their miniature gas stoves and kettles to make some much-needed coffee. The temperature in the forest drops considerably once the sun drops too low to penetrate the canopy, so the thought of an icy shower without something warm to look forward to afterwards is not one anyone’s likely to relish. The Waterfall Hut overlooks a vast, green and misty valley, and could easily pass for a cabin in Alaska’s Katmai National Park. All that’s missing are a couple of grizzlies fishing for salmon. The waterfall after which the cabin was named cascades down a ragged rock face behind the hut, and flows all the way down to the valley below, where Wouter did his best to catch the little rainbow trout gliding in the crystal water. After lugging his fly rod along, Wouter wasn’t going to go home without using it at least once. The second day’s hike to the Dokolewa Pools Hut is a full eighteen kilometres and, although you can cover it in less time, it took us eight hours. Underestimating one’s own fitness levels is a mistake many of us make, and one of our party was suffering the painful consequences of the previous day’s challenging walk. The hike isn’t difficult compared to trails like the Otter and the Fanie Botha, but some of us hadn’t seen a hiking trail for almost a decade. On any lengthy trail a certain amount of physical preparation is necessary to reap the full benefit of the hiking experience. 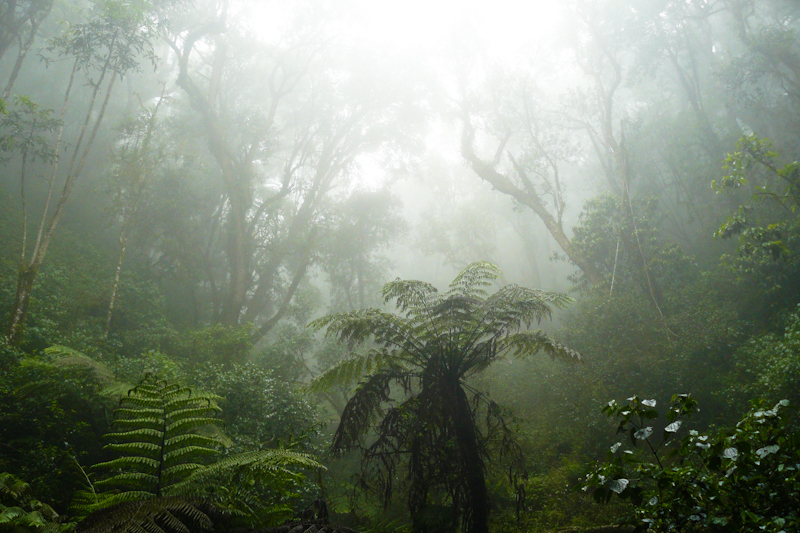 The forest is always spellbinding, and the morning mist enveloping the mountain all around us was particularly mystical. Day two’s trail is a lot flatter, making it a lot easier to concentrate on the surroundings (rather than on our footing and backpacks – considerably lighter now thanks to a suspiciously fast rate of banana consumption!) Gigantic tree ferns as tall as giraffes, and conspicuous star-shaped fungi the size of R5 coins growing amongst the leaf litter draw attention from, what was for us, a damp march through thickening mist. The jungle cats in our imaginations the day before were replaced by the curious eyes of Rivendell, and even the trees seemed to be smiling down at our passing group. 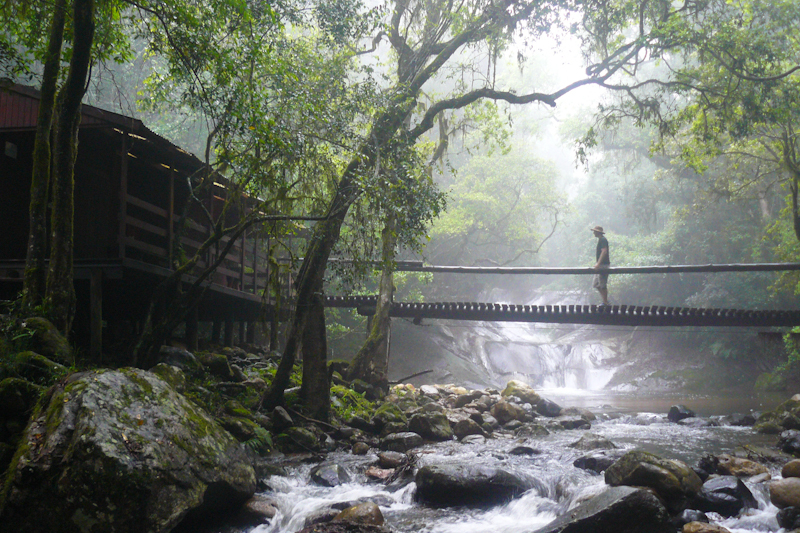 Magoebaskloof is a fantasy world you can’t help but get lost in. Despite the chill, upon reaching the Dokolewa Pools Hut a couple of hours before sunset, we couldn’t resist the temptation to jump into one of the freezing pools of water surrounding the cabin. It was close to unbearable; staying submerged long enough to soothe our aching muscles, but certainly more exhilarating than a cold shower. Fortunately, there’s always enough wood stacked under the lapa to convert the cabin into a duplex so no one has to stay cold for long. Building a massive fire and slipping into K-Way’s and comfy flip-flops, we unloaded the last of our food in an attempt to lighten the load as much as possible for our last day’s hike. The result is a relative feast of two-minute noodles, Mini Cheddars and sachets of tuna, with sides of biltong, droëwors and Melrose cheeses. Only the Oatso Easy and Provitas survived the banquet. As the fire fizzled out, one by one we gingerly crawled into our sleeping bags, our full bellies and warm, clean bodies easing our exhaustion and promising a solid night’s sleep before the final leg of our journey. The Dokolewa Pools Hut isn’t easy to leave behind. Stalling by taking turns to photograph each other on the wooden walkway that connects the cabin with the opposite bank of the river, we committed the sound of the cascading water rushing from one icy pool to the next to memory before heading back into the forest. To our delight, most of the last stretch is spent in indigenous forest, crossing stream after stream – sometimes hopping from rock to rock, but on most occasions idly walking over simple wooden bridges. At one especially scenic crossing, posing again for our final group photo, Wouter uttered, “Wow! This is breathtaking” for about the thousandth time. But nobody minded, because we all wholeheartedly agreed. Since this is quite a strenuous hike, you’ll probably want to leave your SLR at home. But don’t forget to bring a compact digital camera – there’s incredible scenery to capture, along with great memories as you make your way through the forest. There are a variety of options, from two-night trails (± 20 km) to five-night trails (± 60 km), to choose from. From Gauteng, take the N1 North towards Polokwane and then turn off onto the R71 to Tzaneen. Follow the R71 for approximately 70 km and turn left onto a gravel road at a sign post that says: Magoebaskloof Hiking Trail (Woodbush Entrance). The turnoff is also marked. Houtbosdorp. Follow the signs for approximately 4 km to the Woodbush Hut where you park your car. 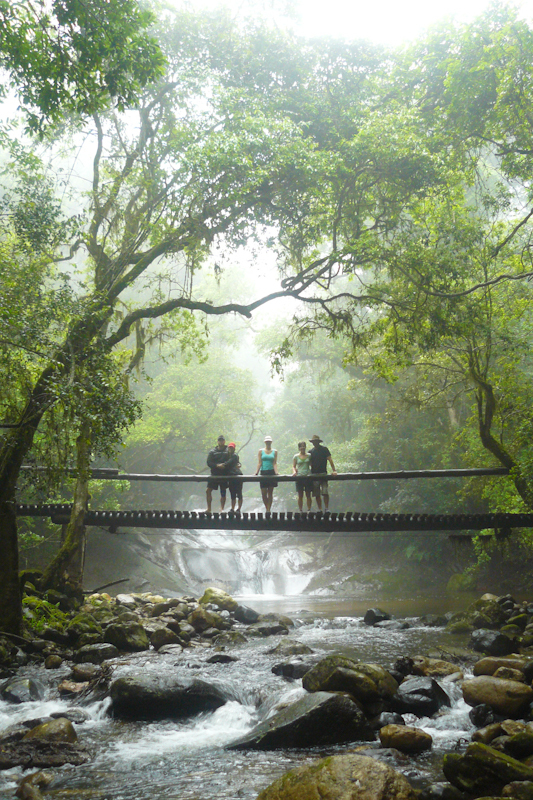 Magoebaskloof’s is mountainous and therefore you’ll often have to climb steep hills or descend into the valleys on muddy trails and over slippery rocks. This trail is not recommended for people with knee problems. The daily distances vary between 9 and 18 kilometres per day, which can be tough going when it’s not level. The fitter you are, the more you’ll enjoy it. What do the huts look like? 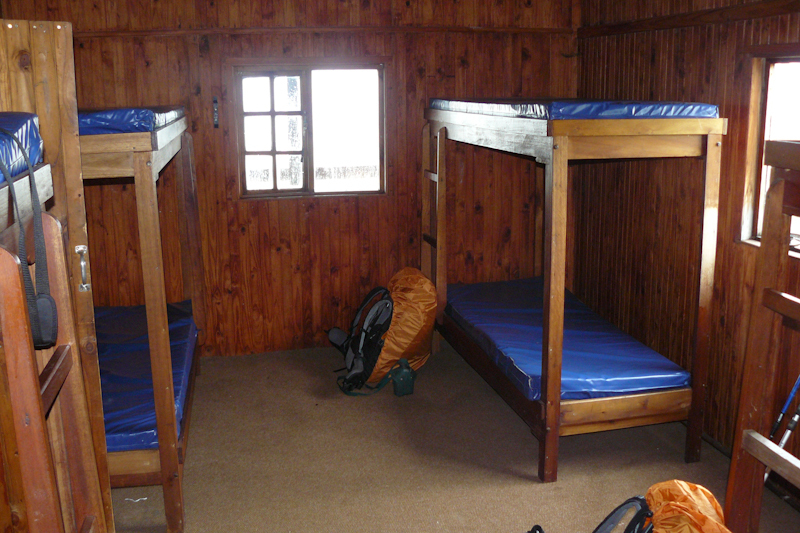 The huts we stayed in are basic but comfortable and all have cold showers, bunk beds with mattresses, flush toilets and plenty of wood. None had electricity. You need to be completely self-sufficient. Bring your own food, bedding, toiletries, cutlery, firelighters and lighting. 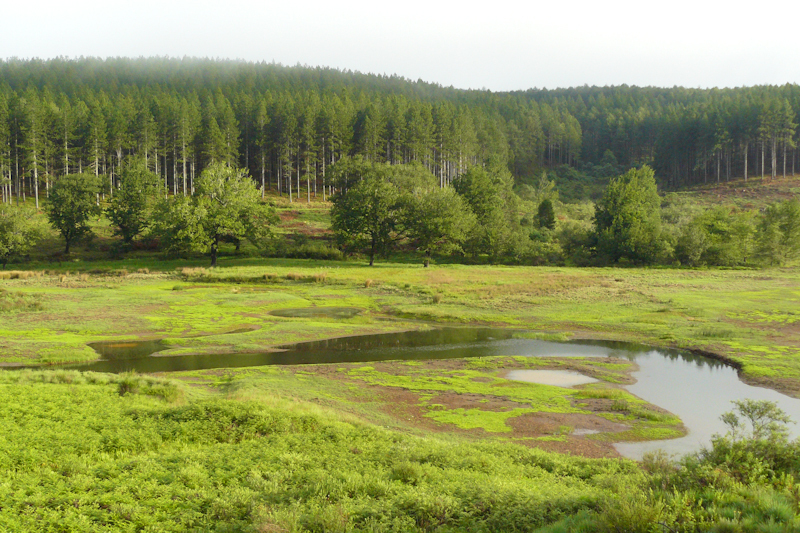 Due to the altitude, Magoebaskloof can be cold, even in mid-summer, so always bring warm clothing with. It’s often misty and damp in the forest so don’t forget a raincoat. A walking stick is very helpful on the steep, slippery slopes. You can fill your water bottles at the huts or in the streams when you hike. Hiking through the plantation is nicer than you might think. 1) Try to keep your backpack’s weight under 15 kg at the start by packing only what’s necessary. 2) Wear proper hiking boots that protect your ankles. 3) Eat energy-providing food such as nuts, energy bars and jelly sweets right throughout the day and drink enough water. 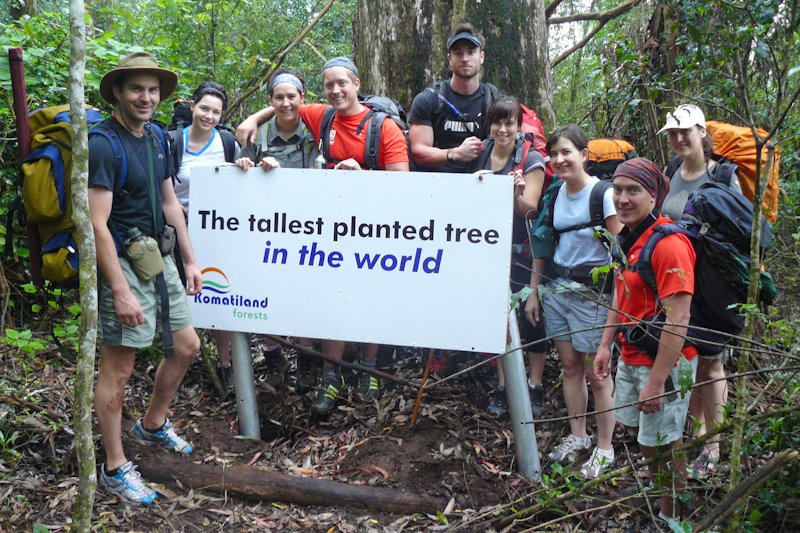 A group photo as the base of the tallest planted tree in the world. I’m looking to do this hike, do you know if you share the huts with other hikers, or once booked are they only yours? -Next weekend as in 27 Feb? We are also looking to book then. Was skeptic to share a hut, but if you say it’s worth it – then so be it. I am planning to do this trail next month and your blog got my mouth all watering. I would just like to know if there is cellphone reception during the hike since my job requires me to be available on my mobile for calls and emails. Could you please advise me? Hi AJ. To be honest, I can’t remember. I try not to use my phone when I hike, but I’m sure the higher points (of which there are many) will have signal. Enjoy your hike! I have a question about day 3. Dokolewa Pools Hut to Woodbush Hut – on this day you would get to Woodbush Hut and go home, is this correct?